I found that the picture taken on my camera phone gave it a more true to life colour than my camera did. Yes, the colours are light and less vibrant than what you see on the website. They are however, shimmery. So, if you can’t wear shimmer or don’t like shimmer, this palette is not for you. I however, like shimmer so I was pleased. 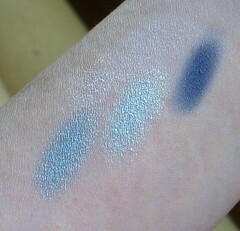 The texture of the eyeshadows are very smooth and fine. I liked that, because in contrast to T’estimo (which I love) the texture feels much better. Only the dark blue felt a little gritty compared to the other colours. I find that the color of the 2 base and contrast shades to be on the sheer side which is quite consistent with most Japanese cosmetics. The dark navy blue is very pigmented however and goes on a little more matt than it looks. So, if you like strong pigmented colours then you might want to give this a miss. However, what I really liked was that the shimmer made up for the lack of strong colour. Once layered over each other, the colours do take on a 3D effect and it looks lovely on the eye. I liked that the blues did not look so strong on as to channel the 80’s effect. I also liked the highlight shades in particular because when I swiped it over my eye it evened out all the colours and gave a nice polished effect. All in all, I’d say that this palette has surprised me because I wasn’t expecting to like it, but I did. The colours were sheer enough and shimmery enough just so its not over done. I’m now thinking about getting the purple palette 04 (review by PJ) because the sheerness of the colour means I might be able to pull off purple when I can’t usually do so. What I did not like in particular was the case. The case has a metallic cover with a pink “jewel” insert. I found that the highly shiny surface attracts fingerprints like nobody’s business so it ends up looking grubby after a while. Inside is a large mirror and it comes with 2 dual ended applicators. 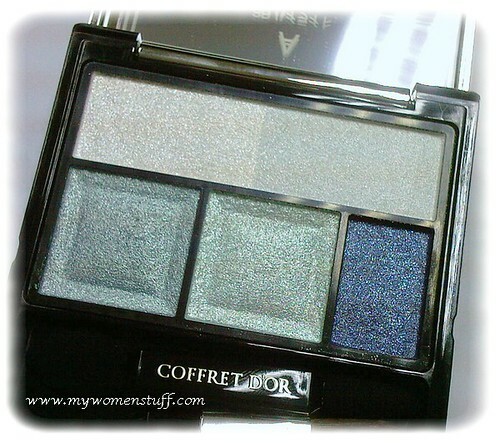 I got my Coffret D’or palette online for US$33. Worth the price? Yes, I think so. i wonder if they have a similar version in their KATE line. perhaps the price would be cheaper. this one kinda expensive ler…. PB says: There was something similar in KATE (highlighter) Let me find a pic of mine. But the quality is far far better! Actually, its not very expensive when compared to T’estimo – about the same price. the colour looks awesome. do an FOTD? PB says: I would but my camera flash tends to wash it out. Let me try again and see. 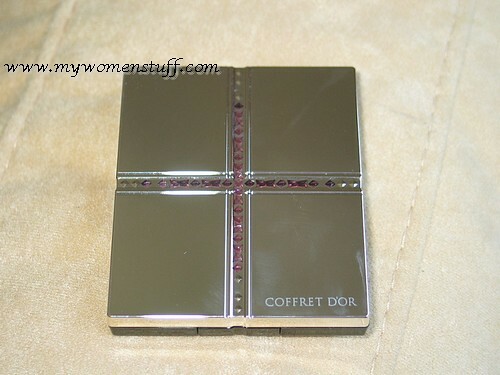 The Coffret D’or collection will be launched in Malaysia on 26 March 2008. PB says: Hurrah! Thank you for the info! Is this in Malaysia edy? how much is it in RM? i saw this appeared lots of times in Nu Ren Wo Zhui Da..
Cynthia: Yes, you can find it at any Kanebo counter for RM120. Hi! Do you think the 02-Fresh will look okay for someone w/ an olive w/ a yellow undertone? I love the colors! Thanks! 02- Fresh is quite cool. You sound like you have a warmish complexion. If you can handle cool colours you can handle this else it might not be such a good choice. Hope this helps. Which website do you buy your Kanebo Cosmetics from? I don’t – I get mine from the local counters. However you can try Strawberrynet, Adambeauty or ichibankao.